This would be a perfect dish to serve to a family that is trying to eat more fish — it is extremely mild with lemon and butter (I skipped the capers), and you can make it with whatever thin white flaky fish looks good at the store. I used wild flounder, but tilapia, snapper, sole, and catfish would also be good. I wouldn’t recommend a thick fish like halibut or cod for this recipe. I had never actually cooked fish using this process of dredging in flour and then lightly pan frying in olive oil before, and it turned out so well. The sauce was initially very strong with lemon, because I accidentally put the butter into the green beans instead of the fish sauce. Those were some really delicious green beans (since I had already tossed them in olive oil and lemon juice!). 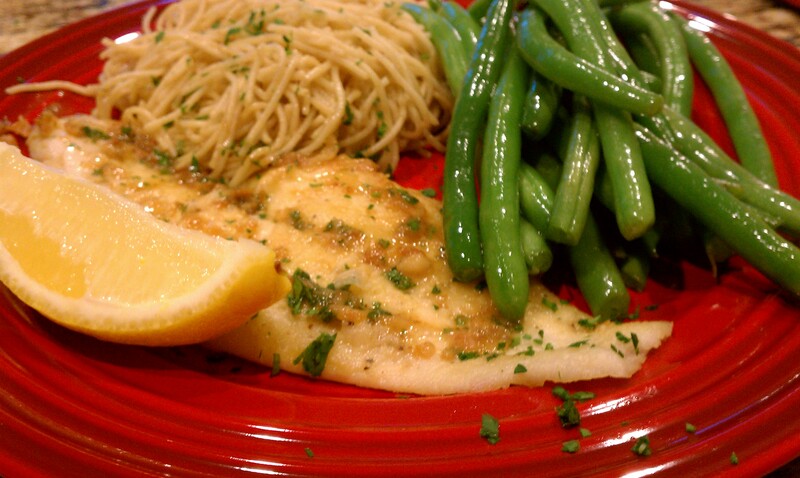 Both the Fish Piccata and the Angel Hair Pasta recipes are from Melissa d’Arabian. You really want to serve them together as all the flavors combine so well (lemon, butter, olive oil, parmesan). And if you keep some fish fillets in the freezer, this is a super easy dinner to throw together with things you already have on hand. With the ingredient lists so short, these aren’t as much recipes as they are methods of cooking, but I’m thrilled to now know how to cook fish this way and the kids loved it. I really enjoy a quick soup-and-sandwich dinner on busy nights. Any kind of vegetable-based soup with a grilled cheese or tuna melt is easy, healthy, and on the table in five minutes. The problem is that my sweet 4-year old, Lauren, does not seem to like ANY of the soups I have put in front of her. Every time I try a new variety, she responds with, “I only want carrot soup Mommy”. Okay, I have never seen a plain carrot soup in the store, and trust me, I have done a lot of looking. 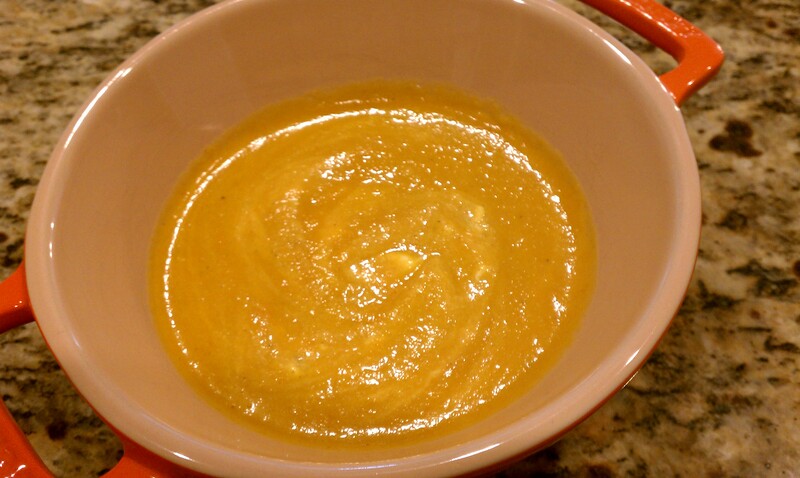 I saw Melissa d’Arabian making Orange-Scented Carrot Soup on her show, Ten Dollar Dinners, and realized it was time to invest more than my normal five minutes and cook up some carrot soup at home. As a bonus, oranges are another of Lauren’s favorites. But knowing this was my chance at creating a soup my daughter would actually eat, the pressure was on. And did I mention she’s never actually tried carrot soup? After reading the reviews on this recipe, I cooked the carrot-onion mixture a lot longer than five minutes before going on to the next step (at least 15 minutes). I also cut the oregano down to 1/2 tsp, added 1/2 tsp of ground cumin, and a pinch of ground ginger. Since I had already zested oranges per the recipe, I squeezed in some orange juice along with the wine. I used an immersion blender to blend the soup right in the pot. The sour cream swirled in at the end is a great addition — don’t skip that part. The soup was simple, nutritious and tasty. You could really taste and smell the orange after adding the zest and juice. As for Lauren — she ate a few spoonfuls, said it was, “okay”, and then told me what she really wanted was tomato soup.